When a loved one is dying, small comforts like a warm quilt, soft lighting or soothing music can help make a hospital room a little more comforting. That’s the idea behind new Comfort Carts at South Shore Regional Hospital in Bridgewater. The carts contain a variety of comfort and convenience items including books, notepaper, snacks, drinks, tissues, music and a blanket. They are on wheels so they can be easily rolled into a patient’s room. That’s something David and Allison Weagle understand. When David’s brother Gary passed away in Ontario several years ago, hospital staff there went out of their way to make the family’s difficult experience a little easier. They have been making an annual donation to the Health Services Foundation of the South Shore in support of Palliative Care ever since. Over the years, the Weagles have furnished a quiet room and purchased equipment such as pulse oximeters and pocket talkers, which are hand held amplifying devices that reduce background noise. 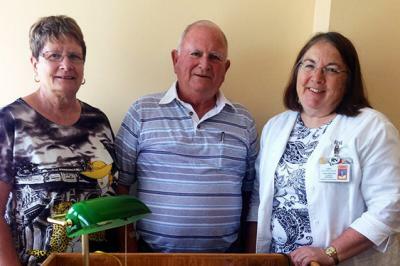 This year’s donation was used to build and buy supplies for four comfort carts at South Shore Regional Hospital. “Palliative care is really important to us and we really liked the idea of being able to wheel the carts to where they’re needed. They’re beautiful, and will help a lot of families,” said Allison. The Health Services Foundation works with donors to purchase medical equipment and support South Shore Regional Hospital and Fishermen’s Memorial Hospital and enhance healthcare on the South Shore.